FULTON, NY – Staff and volunteers at Catholic Charities of Oswego County have been busy preparing for this year’s Thanksgiving food basket distribution. Helen Hoefer, supervisor of Catholic Charities of Oswego County Community Services (second from right) joins Emergency Services Assistant, Danielle Losurdo (right), AmeriCorps member, Leslie Ross (left) and volunteer Marge Corsoniti (second from left) in preparing Thanksgiving food baskets. 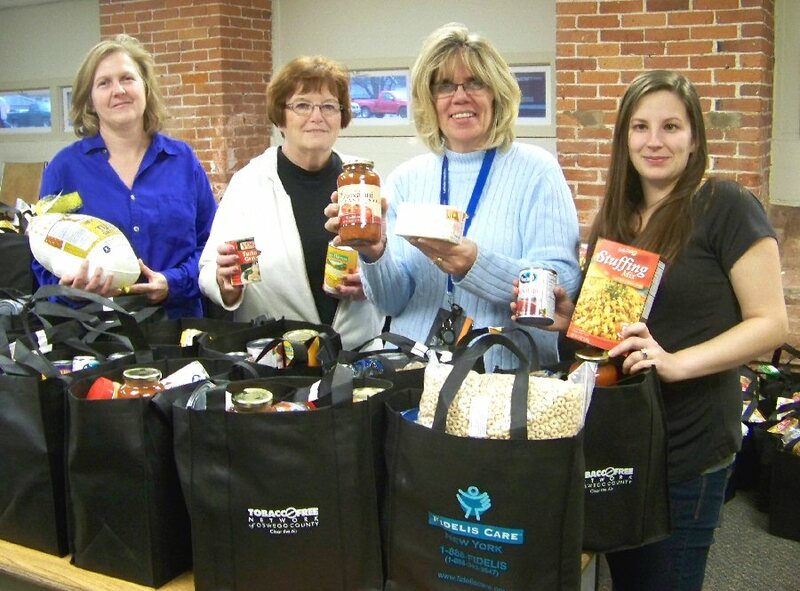 Catholic Charities is distributing more than 300 food baskets to families in need in Oswego County. For more information on Catholic Charities, or to help support their Christmas food basket program, contact Hoefer at 315-598-3980, ext. 224. Thanks to donations from concerned community members and area businesses, Catholic Charities’ food pantry will provide more than 300 families with all the fixings for a complete Thanksgiving meal. Looking ahead to their Christmas food basket distribution, Hoefer added that Catholic Charities is receiving a large amount of requests this holiday season. “I encourage those who are able to consider donating non-perishable food items so that we will be able to help as many families as possible this Christmas,” said Hoefer. For more information on Catholic Charities’ Christmas food distribution contact Helen Hoefer at 315-598-3980, ext.